Just a random little sketch as I wait for my new markers and paper. This old paper wasn't so great so the coloring is a bit streakier than I'd like. I came up with this drawing when I saw Minnie & Max The Pug's post about how after someone passed by them she said to their friend, "Isn't it weird how some owners look like their dog?" (to which the pugs took great offense). Whenever I draw my grumpy face I often think that it resembles a pug's perpetual sad-looking face. 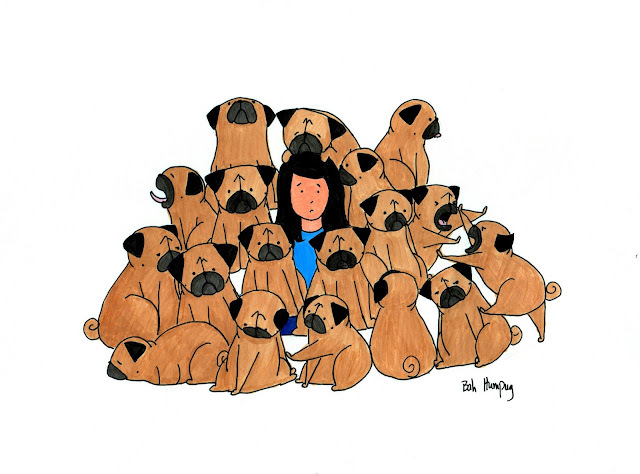 So here I am, among the pugs. One of them. I love this! I have 6 wonderful pugs, would you mind if I embroidered this design? Great idea, Bren! I'm an embroiderer, too! It's a wonderful drawing. Looks like a dream!